Born 1984/​12,​educated,​very pretty,​voluptuous,​loves animals,​intelligent,​outgoing. Employed at reputed international organization. The future partner should be over 5’5’’,​educated,​smart and fluent in English prefers courting before marriage. English educated family,​Bud/​RC. Father retired hotelier,​mother employed in reputed organization. Younger bothers employed,​live in Australia and NZ. m​a​r​r​i​a​g​e​p​r​o​p​o​s​a​l​c​e​@​g​m​a​i​l​.​c​o​m​Tel: 081-2222038. B/​G parents Colombo seek an academically and professionally qualified son TT/​NS from a respectable family for their 23,​5’4’’,​fair,​complexion,​pretty,​pleasant kind hearted daughter who currently studying for a Bachelors degree in Marketing & Management,​final year student born in 1995/​April. Please reply with horoscope and all the family details. p​r​o​p​1​9​9​5​n​e​w​@​g​m​a​i​l​.​c​o​m​011-2712193 call after 7.00 p.m. on weekdays & weekends any time. Colombo Buddhist Govi business parents looking for a matching partner for 1984, September born, senior manager in a reputed company (Studied in Visakha Colombo BBA, MBA) very beautiful, pleasant 5’9” daughter owning a brandnew car. Sister engineer, brother business man. Colombo B/​K mother seeks a professional son for lovely daughter 36y fair,​slim,​never married high profile engineer,​kind unblemished Character with assets,​living in Australia. Partner must be either living or willing to migrate. Reply with horoscope. Email address: r​a​n​d​p​r​o​p​o​s​a​l​@​g​m​a​i​l​.​c​o​m​T.P. 2862620. Colombo,​born 5’4”,​1992,​height 5’,​slim,​normal figure,​Lecturer daughter parents seek well-mannered Doctor or Engineer partner. 0112418897. Father Buddhist,​mother Christian seek a qualified son for their 26 year daughter qualified in Mechanical Engineering and employed in a foreign Architectural Company in Colombo. Height 5’5”. Please reply to d​.​s​a​m​a​r​a​w​e​e​r​a​@​h​o​t​m​a​i​l​.​c​o​m​or 0112541109 during weekdays 9 a.m. to 5 p.m.
Govi Buddhist parents from Kandy seek a partner for their well-mannered, caring only daughter brought up in Buddhist SriLankan environment and values, age 30 years (born 1988 November), height 5’-4”, inherits substantial assets, currently living and employed in the financial sector in Canada. She is a graduate from a Canadian University and currently progressing towards her Chartered Accountancy qualification. We are looking for a son who is currently living in Canada or USA or willing to migrate from another country to Canada. Religion and cast immaterial. Her horoscope chart shown as Kethu at 7. Confidentiality assured for all correspondence and information. Please respond with full details and horoscope to email : [email protected] or to the newspaper reference. Graduate or undergraduate son age 21 to 26 is sought by Govi /​Catholic parents to form a relationship leading to marriage with daughter age 21 very pretty,​fair,​tall excellent character and brought up with Sri Lankan values. She is very intelligent,​receiving Bachelors Degree from a leading University in USA May 2019. Parents own multiple houses both in USA and Sri Lanka. Differences immaterial. Email: m​i​l​a​2​2​2​@​s​b​c​g​l​o​b​a​l​.​n​e​t​. Tamil parents from Wattala living in own residence,​retired Govt. 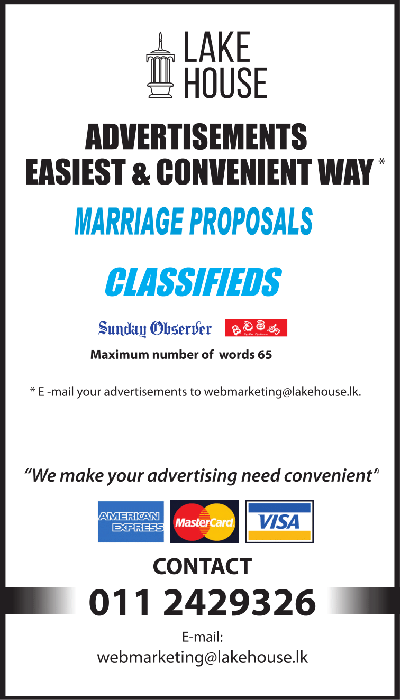 servant looking for a partner for their divorced 34 years daughter (four months married life in 2012) educated in a reputed girls’ school in Colombo,​doing Attorney finals in Law. Divorcees should be without kids. Contact 0112948562.